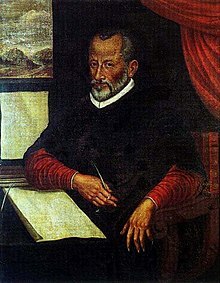 Da Giovanni Pietro Aloisio Sante da Palestrina (* umara 1515/1525 z Palestrina, Latium; † 2. Feba 1594 z Rom) wor a italienischa Komponist vo Kiramusi. Ea is da berihmtasde Vatreda vo da Remischn Schui vo Komponistn in da Renaissance..
Sei Weak hod an bleibendn Einfluss af de Entwicklung vo da Kiramusi ghobt und guit ois Gipfe von da Renaissace Polyphonie (Meastimmigkeit). Missa Nigra sum 5 14 Transposed hypoaeolian Parody Jean l'Héritier's motet "Nigra Sum"
Missa Qual è il più grand' amor? 5 21 Transposed hypoionian Madrigal by Cypriano de Rore? Missa sine nomine 4 15 Mass by Jean Maillard on his own theme "Je suis deshéritée"
Those marked with an asterisk form a cycle of 29 settings from the Song of Solomon. Incipit lamentatio Jeremiae Prophetae. Aleph. Quomodo sedet. Vau. Et egressus est a filia Sion. Jod. Manum suam misit hostis. De lamentatione Jeremiae Prophetae. Heth. Cogitavit. De lamentatione Jeremiae Prophetae. Heth. Misericordiae Domini. Aleph. Quomodo obscuratum est aurum. ↑ A eulogy gives his age as 68, and on that basis Grove gives a birthdate "almost certainly between 3 February 1525 and 2 February 1526" (The New Grove Dictionary of Music and Musicians, 2nd ed., s.v. "Palestrina, Giovanni Pierluigi da" by Lewis Lockwood, Noel O'Regan, and Jessie Ann Owens).